Raise your hand if you’re feeling personally victimised by England’s ever-changing weather right now. Gooodness, it’s been a crazy few weeks, from wind to rain to sun to storms to the disgustingly sticky muggy mess (literally the worst kind of weather). Who even knows what to wear anymore, do you take a jacket? Can you get your legs out? Are jumpers acceptable yet? I was just coming to terms with the fact it is now Autumn, there’s no more holding onto summer, and I was actually quite excited I bloomin’ love Autumn. Then it was as sunny as anything, like nothing had changed? We’re in this no mans land between seasons, and nobody really knows what to expect. But the transition from Summer to Autumn is definitely nye, so with that in mind, I’ve been doing some trans-season shopping, which I have a love hate sort of relationship with, I always want to go straight to the chunky knitwear and thicker tights, but alas that’s not how the weather works. I think the one thing I’ve focused on mainly when shopping is getting small doses of Autumnal colours and pieces to inject into my wardrobe, and find more layering pieces. I mean, I love layering and all I really wear is black, greys and white so I found it easier than expected. I’m also loving everything oversized at the moment, it’s pretty perfect for whatever the weathers throwing at you. 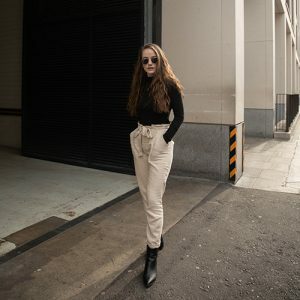 There we have it, another fashion post by moi, I’m still getting into it but I hope you liked it! I’m so excited for autumn but I’m sad to see summer go. Love that leather skirt. Loooove your hair in these images! Love this outfit! Must recreate it myself! I honestly just want autumn now! Fed up of the hot sweaty weather! I had seen you rock this outfit on Instagram before I read this post and I must say I love it!